Way Cool is the third Level in the Special Zone of Super Mario World. Way Cool consists mostly of shifting platforms, enabling the player to traverse the level. Way Cool consists of one long screen, with a few Warp Pipes that lead to other screens if the player wishes to take them. The level contains eight Dragon Coins, four in the Yoshi's minigame area and four more in the main area. The player has 300 seconds on the Timer to find the Giant Gate. Fuzzies, besides a few Chainsaws, are the only enemies found in the level. The yellow Warp Pipe area. 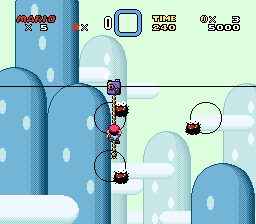 If the player has a Cape Feather, it is possible to fly through the entire level; however, it is tricky as the player will need to clear a high up yellow pipe. If the player can land on this pipe, it will lead to a ? Block where a Yoshi is found. The exit pipe of the area will lead to a short platform with another ? Block, this time the ? Block contains Yoshi's Wings, and the player can pass the level easily that way (provided that Mario or Luigi are on a Yoshi). If the player does not have the cape, the plumbers have to navigate through a maze of Fuzzies, Chainsaws and ON/OFF Switches, which the player chooses the right direction for the moving platform where they stand to pass the stage. Alternatively, if Mario or Luigi has a Cape and a Yoshi, he can simply bounce across on the enemies. The rest of the level consists of the heroes avoiding Fuzzies while they hang on moving Ropes. This page was last edited on April 9, 2019, at 03:08.